Palaver -- An assassination squad of Liberian mercenaries has been brought into the country and deployed in the Northern Region with 15 men based at Yendi, 25 men based at Karaga and 10 men based at Tolon and armed with the most sophisticated of weapons including Israeli-made Uzi sub-machine guns and AK 47 rifles, with the objective of assassinating former President Rawlings and his aides during their planned campaign trip to the Northern Region by faking an armed robbery attack on the ex-President's convoy. Alpha Bravo and his gang of political desperadoes who brought in the mercenaries have lied to some of the chiefs in the region to play host to the mercenaries by promising them the moon, including a promise to the Karaga-Na that the NPP Government would elevate him to be the new Ya Na should the assassination squad succeed in killing ex-President Rawlings and should the NPP win the December elections. 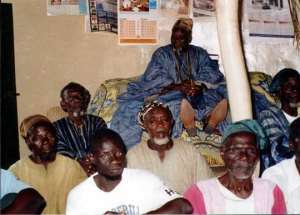 Tension is brewing in the area because some of the mercenaries have been identified by the locals as persons who participated in the March 2002 attack on the Gbewaa Palace during which the Ya Na Yakubu Andani II and 40 of his elders were murdered in cold blood, and that there was a near-attack on the Liberian mercenaries last Saturday night but for the intervention of some Dagbon elders who advised on a closer monitoring of the mercenary infiltrators, leaving the Dagbon area in a state of continued tension, fear and anxiety?